Sliding panels are a great way of concealing your TV. The panels slide to reveal the TV. 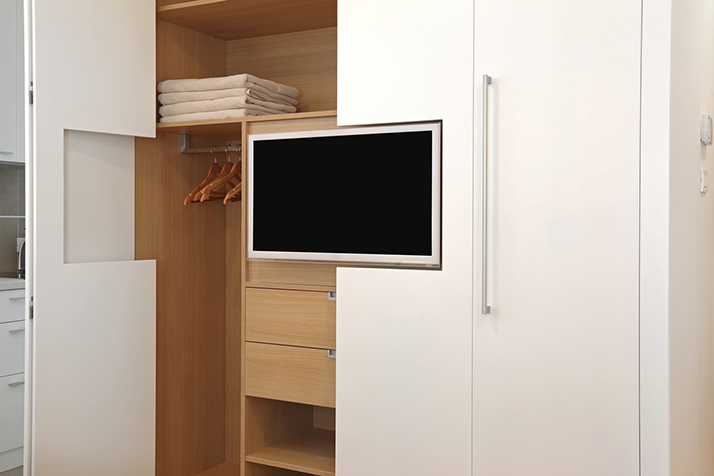 To install sliding panels, the TV is first mounted on a wall then a shallow cabinet is built around it. Sliding panels change the entire view of the room allowing it to change from sophisticated to casual. Sliding floor-ceiling panels can also be used. The color of the sliding panels should, however, blend with the wall to conceal your TV properly. Covering a mounted television with a sliding work of art is also another way to conceal the TV. These artworks can be controlled with a remote control or with the push of a button. A television can be surrounded with framed photos of your family. This can be useful when there is a large empty space around the TV. It is advisable to use frames with the same colors as the TV's frame to ensure they blend together. Putting a TV over the fireplace may seem counterintuitive, maybe brining more attention to it than may seem necessary. But this is actually an ingenious idea. With some cable management, a television over the fireplace can be an elegant way to disguise it. Custom made beds come with these types of the cabinet that hold the TV. These cabinets move up and down depending on whether the TV is in use. These cabinets are custom made to match your style.